This has been a long time coming. 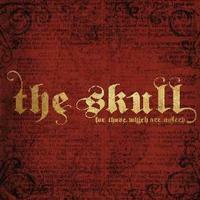 The Skull continues the legacy begun by Chicago’s doom metal masters Trouble thirty years ago. Although the name of the band is different and some of the players are also different, The Skull is really the 80s version of Trouble in every aspect. It is certainly worth noting that Trouble itself is still going strong and creating worthy material, but for those who worship the first two Trouble albums with Eric Wagner from the 80s, The Skull will be like the return of an old friend. Eric Wagner’s other band Blackfinger focuses a bit more on hard rock and psychedelia, but with The Skull he returns to truly heavy doom metal. Trouble members Ron Holzner and “Oly” Olson contribute the thunderous bass and drum attack while the guitars are handled by former Pentagram member Matt Goldsborough and Spillage’s Lothar Keller. The sound these men create is thick, gloomy and incredibly heavy while never eschewing melody. And there are some individual touches that keep The Skull from being a total Trouble tribute band. Doom bands are crawling out of the woodwork these days, but the originals still do it best. For Those Which Are Asleep is mandatory for doom fans. The album begins with a ponderous gloomy Sabbath-like riff that will bring a huge grin to the face of anybody who loves truly heavy music. Then Eric Wagner’s trademark eerie nasal vocals chime in, and we’re on our way. Like Ozzy Osbourne, Wagner’s tones are uniquely suited to relating tales of depression, mental anguish and darkness. There is a lighter break in the middle, but this song for the most part is pure heavy, catchy doom metal in classic fashion. Ominous bass tones segue into a killer doom riff that could have come directly off the very first Trouble album released in 1984. This whole song could have been on that epic record with no problem. The soloing from Goldsborough and Keller maintains the standard set by Franklin and Wartell years ago. If anything, this is the slowest and doomiest song yet. It might be the heaviest on the disc. The guitar tone is crushing. But the sound on the verses is right out of Cream’s playbook and hearkens back to when psychedelia ruled the day. This is an awesome combination of the most crushing doom and the spaciest 60s influenced rock. The second half of the song picks up the pace slightly with a monster bluesy groove. The Skull really comes into their own on this track. The piano and organ sound that starts this off is surprising and stark. This tune is really different. It has a depressing, melancholy sound, but it’s based more on keyboards than guitar. It really worms its way into your brain. The guitar is still there and still very heavy, but its application is very subtle. This is primarily a dark rock song as opposed to pure metal. But it fits here perfectly. This is even groovier than “Send Judas Down,” almost to the point you could say there’s a funk influence here. The guitar is still super down tuned and chunky, placing it firmly in the metal realm, but this is the most overtly “retro-rock” track here, right down to the very 70s sounding guitar soloing. I love the swaggering gallop that kicks this off. Parts of this really remind me of the very early Trouble. It’s a really cool mix of doom metal and rock n’ roll….and that was always the great strength of not only Trouble, but also Black Sabbath and Pentagram. On this song, the Skull close the door on their past and establish their own legacy. What a fantastically written and arranged song this is! The low key acoustic bits are stirring, and Wagner’s vocals are in a lower register than usual. When the heavy guitars slam in on the chorus, it’s doom perfection. Incredible riffing in the mid-section forms a firm foundation for the lengthy guitar solos and melodies. This is one amazing song, easily better than most of Trouble’s work. The title track is a hard act to follow but this tune tries its best. It has a more metallic, aggressive sound all around, with a gritty guitar tone. This cut grinds away with a mid-speed tempo. There’s some more excellent twin guitar work from Keller, and Goldsborough and the vocals on the chorus are surprisingly melodic, providing a counterpoint to the aggression of the rest of the song. The album concludes with a remake of a classic Trouble song. This is the only place where the album really stumbles, as this isn’t even half as good as the original. It just sounds kind of…off. The guitar is not as doomy and thick as the original, and Wagner’s vocal performance doesn’t match what he’s done before. Even so, there are some classic doom riffs here.